Tarlton Corporation is a St. Louis-based, privately-held business providing general contracting and construction management services. 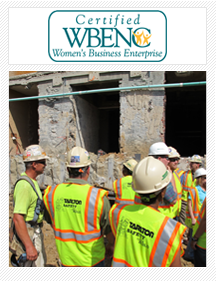 Formed in 1946, this WBENC-certified Women’s Business Enterprise serves a wide range of clients in the institutional, life sciences, federal government, power, industrial and commercial markets, as well as concrete repair and restoration. Tarlton’s projects range from $10,000 to $150 million in both new construction and complex renovations, led by teams that thrive on meeting unique construction challenges. With the motto “Let’s Build,” Tarlton operates under the auspices of the Golden Rule: treat others as they—the staff members—would like to be treated. The firm has built a reputation as one of the Midwest’s leading builders through a passion for excellence across the organization and ongoing investment in employee education, resources and technology. Tarlton has helped shape the St. Louis landscape, completing landmark projects for businesses and institutions including Ameren, BJC HealthCare, Metropolitan St. Louis Sewer District, Monsanto, Nordstrom, Pfizer, Washington University in St. Louis, Wexford Science & Technology, the Saint Louis Zoo, Saint Louis Art Museum, U.S. General Services Administration and U.S. Army Corps of Engineers. In addition to its many award-winning projects, Tarlton is consistently recognized for its strong safety record, outstanding relations in the subcontractor community, industry leadership and community involvement, including initiatives to be more sustainable. Tarlton’s expertise in sustainable construction and operations is showcased in the company’s LEED Silver headquarters. The firm ranks among Engineering News-Record’s Top 400 Contractors and St. Louis’ Top 50 Businesses and was named a “Winning Workplace” for its demonstrated commitment to employee health and well-being. Tarlton’s leaders have held top posts in the Associated General Contractors of St. Louis and the AGC of America, also serving on boards and committees of numerous civic organizations.